Demolition, above, began on November 6th, a day after the TOB Planning Board approved the final site plan. On the night of Nov. 5th, the MIFD ran practice drills on the two buildings, with permission of the owner. 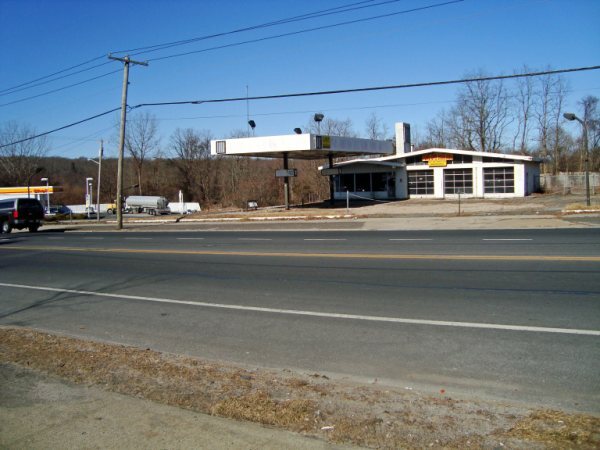 On August 22, 2018, following MICA’s testimony in support, Zoning Board of Appeals members voted unanimously to immediately grant the two types of variances needed for Nelin Realty’s 7Eleven/Fuel Station project to proceed. On to the Planning Board! Mike Nelin hopes to take both buildings down in October. The project has a 120 day timeline. The Town of Brookhaven held a Public Hearing on Thursday, January 25, 2018 at 6pm to consider a Change of Zone and Special Permit required to construct the 7 Eleven and fuel station on the northeast corner of RTs 21 and 25 in Middle Island. After working with the owner for more than 18 months on this project, MICA spoke in favor of these requests at the hearing. We welcome an end to the two blighted buildings that have stood at the heart of our community for far too long. We will continue to monitor the site plan and work with the owner to fine tune signage, fencing, litter abatement, native plantings, safety and more. We hope to have a historic photo of the former Pfeiffer’s General Store incorporated into the signage. After the testimony of MICA President Gail Lynch-Bailey (shown below), MIFD Commissioner Craig Tunjian and concerned neighbor Lee Abrahamson, the TOB unanimously approved the COZ, Special Permit and waivers, which will allow this plan to move forward to the ZBA and Planning Board. “Good evening and a belated Happy New Year. It’s a pleasure to be here tonight on behalf of the Middle Island Civic Association to support of this proposal. We previously submitted a letter to the Planning Commissioner indicating that MICA voted overwhelmingly in favor of the project at out August 17, 2017 regular meeting. 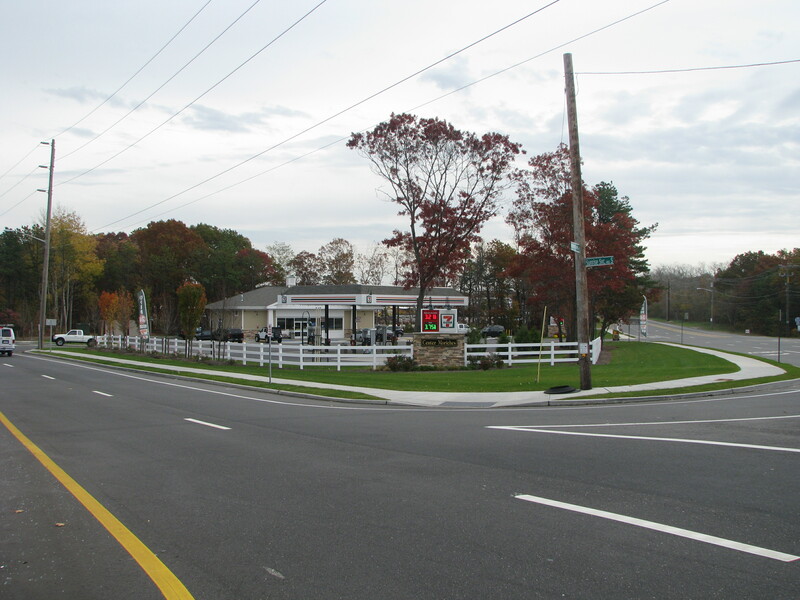 This property lies at the heart of Middle Island, our community crossroads, where Rts 25 and 21 intersect. Many of you know it’s been vacant and blighted for far too long. So we’re happy to see a viable plan moving forward for this corner. To be honest, we’d rather it was Starbucks/Gelato Bar/ Hydrogen refueling station, but it’s not. And that’s okay. Hamlets generally need a McDonalds and a 7Eleven before other brands take notice. In the interest of full disclosure, I LOVE 7Eleven coffee and so do lots of other people. The new residents of Renaissance Village are excited about this project, too. I want to emphasize for those unfamiliar with the site plan that both the dead gas station AND the vacant strip mall will be coming down, to be replaced by a single building and gas pumps. The site plan underwent several iterations which MICA reviewed, including the current one which was approved by the Pine Barrens Commission this summer. Thank you, Supervisor Romaine, for your role in that. 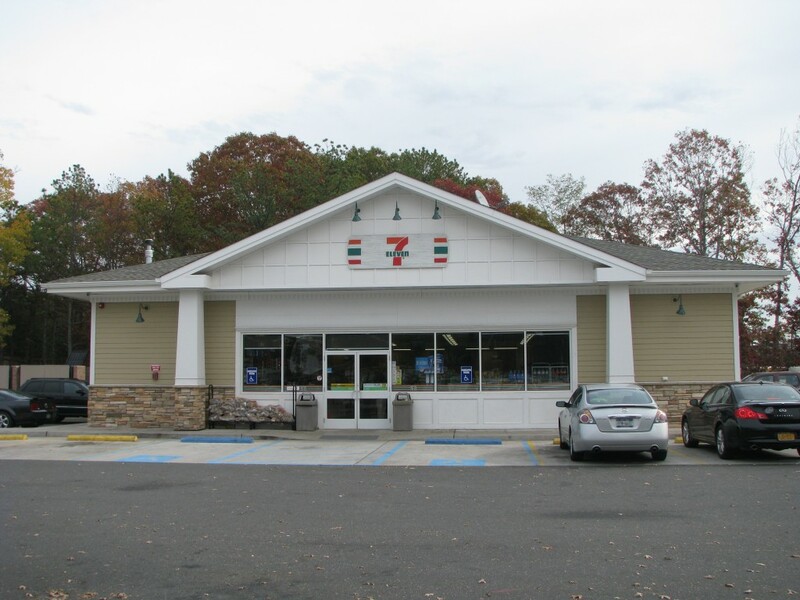 We also like the country feel of this type of 7Eleven; Councilman Panico, I know you were instrumental in the design of the Moriches 7Eleven that this one is modeled on, so thank you for that. This combination convenience store/ gas station is really a resurrection of past uses. 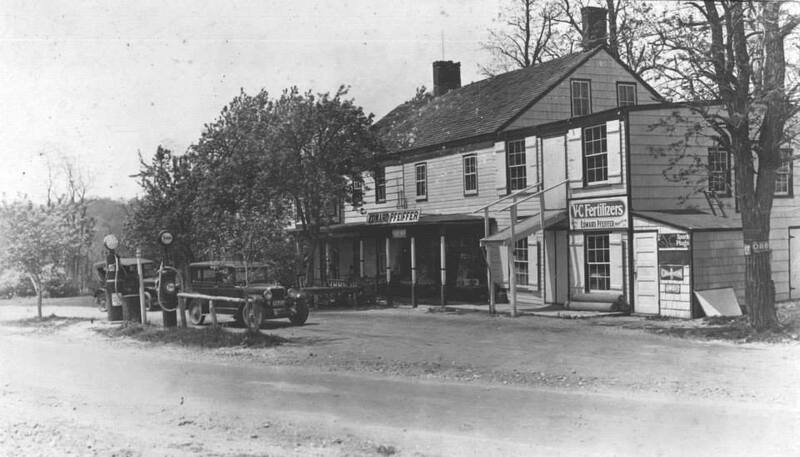 I’ve brought along a photo of Pfeiffer’s General Store, which stood at that corner for more than a century. Not only are the old hitching posts still visible, but so are some gas pumps right alongside them. There are inevitable concerns about traffic, litter, crime which the civic shares with our neighbors and has shared with the developer. We will continue to work on these well after the site is open for business. We also hope to have some of the Pfeiffer’s photos incorporated into the signage on the corner. This would be a great counter balance to the lovely signage diagonally across from the site on the Longwood Library corner. Mr. Nelin has expressed a willingness to do this and we will take him up on that! After several iterations, the above plan was submitted to the Pine Barrens Commission for a Hardship Waiver that was heard on June 21, 2017. MICA supported the revegetation plan that would eliminate any potential gathering area behind the proposed 7Eleven that might promote nefarious activities plaguing other areas along the Middle Country Road corridor. The PBC granted the waiver at its August 16th meeting. The approved plan will result in more than 47% of the parcel being landscaped with native plantings and a single, new 2,995 sq ft building replacing the decrepit old station and strip mall. Attorney Keith Brown presented this latest plan at the August 17th MICA meeting. He explained that the plan must undergo three hearings at the Town of Brookhaven: Town Board for a Change of Zone/special permit, Board of Zoning Appeals for a few minor variances, and the Planning Board for site plan approval. MICA voted to support the COZ application at its August meeting. 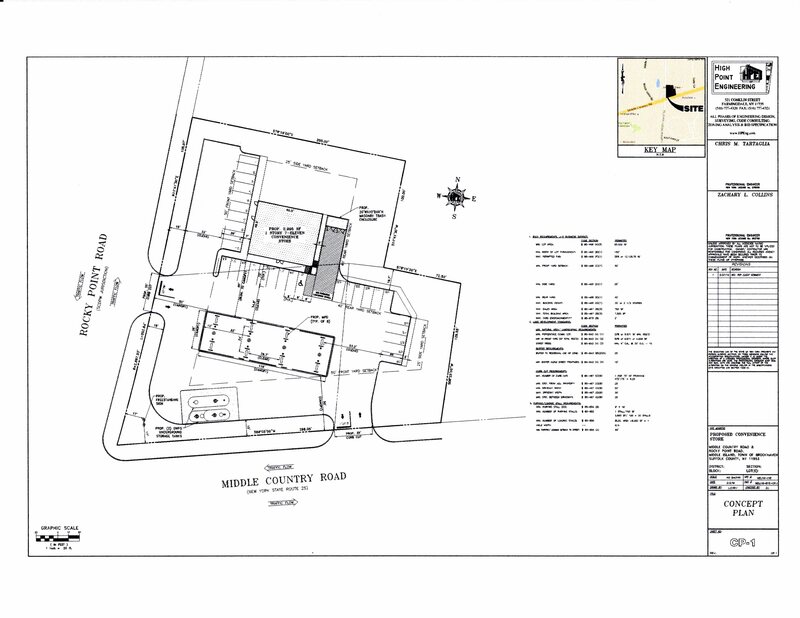 Realtor Richard Nelin and attorney Keith Brown attended the August 18th MICA meeting to discuss plans (above) for a possible combination 7Eleven/gas station at the parcels Nelin Realty owns on the northeast corner of Rts 25 and 21 in Middle Island. The project would utilize both parcels that are now home to the empty gas station and strip mall, as well as a portion behind the existing gas station. There would be four gas islands with 16 pumps, and the facility would be open 24 hours. Reaction by MICA members at this meeting was mixed: some are happy that this blighted corner could soon be resolved, others would prefer to wait for something — anything– besides a 7Eleven. More details are needed before MICA takes an official position on this proposal. We will work with the property owner and the Town of Brookhaven as this project moves forward. The public is very aware of the problems at the 7Eleven just to the west: drugs, crime, prostitution behind the store, shootings at people in the parking lot, major bust by US Marshalls earlier this spring, attempted robbery last month. EMTs, ambulance crews and volunteer firefighters respond to this location many times a week. Everyone is understandably concerned about another similar business generating the same types of problems in Middle Island. What sorts of requirements or covenants exist – if any — in TOB Code that could force the owner/operator/landlord to keep this a crime-free and good-looking establishment? This property has been an eye sore in the heart of our community for 15 years. Nelin Realty has been making money while perpetuating this blight via a rental agreement with Rite Aid that prevents any other competing drugstore from building there. While all are eager to see this blight end, Mr. Nelin should offer some major community beautification givebacks at this site. Landscaping, planting boxes, signage complimentary to that at the library corner (diagonally across the intersection), are important. What does Mr. Nelin currently have the right to build there, “as of right” so to speak? What else does he need, such as special permits, etc? Why is the lease with Rite Aid breakable now? Couldn’t it have been done earlier? What is WalGreens’ role? Is it true that the lease continues to 2026 and the blight could last another 10 years? Why can’t something other than a 7Eleven/gas station be built there? The public has many other suggestions! When polled, the civic members requested anything BUT a 7Eleven. Please confirm that both parcels, the dead gas station AND the empty small strip mall, would be used for the project. Mr. Nelin has recently said this is the case. This is important. How would traffic enter and exit the combined parcels? It’s a very tricky corner. Wouldn’t certain turns have to be prevented for safety? Where would parking be? How many spots? How many gas pumps would there be? Aren’t there concerns that a gas station would be fought by environmental groups given its location near the Carmans River? Would the developed property generate more property taxes? Details would be helpful here. What would the construction timeline be? Mr. Nelin and Mr. Brown said the design of the proposed project would be similar to that of the one recently built in Center Moriches, pictured below. We await additional drawings to confirm this. It’s hard to believe it’s been three years since Tom Talbot and Gail Lynch-Bailey met with Michael Nelin at the Coram Diner to talk about these properties. Time sure flies. At that meeting, Mr. Nelin was excited about possibly building a Quik-Check there, and he assured us the non-compete lease he has with RiteAid is easily broken. Obviously his subsequent meetings with the TOB proved unproductive, because we still have that vacant gas station and strip mall there for all to see. 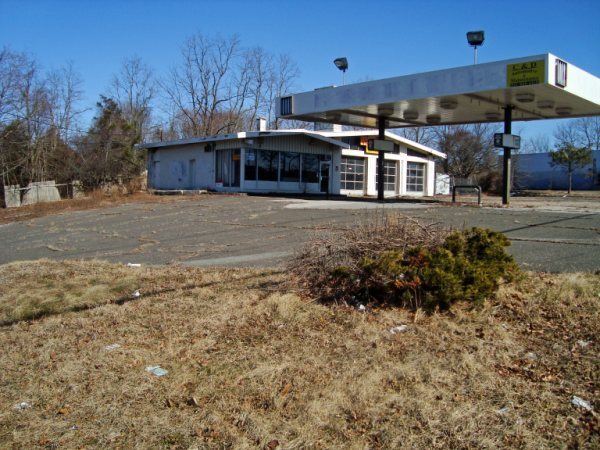 Although we do not think the community will support another gas station at that site, we know everyone is eager to see something successful there. Things are changing for the better in Middle Island – and we want Nelin Realty to be part of that change. The old Island Squire restaurant was demolished in 2015, and Breslin Realty took down the Kmart building this spring. McDonalds is moving to the King Kullen shopping center. The Longwood Public Library has returned to its beautifully expanded headquarters at our community crossroads – diagonally across from Nelin’s holdings. And Sandy Hills is almost completed, which means Nelin’s parcels will have access to its STP and its hundreds of new residents. Did you know that the Nelin property once functioned as the town center of Middle Island? Pfeiffer’s General Store stood there for more than one hundred years. It started as an inn and tavern, was a stage coach stop and served as the post office until 1957. The store was a social meeting place where people came to purchase supplies, get a haircut and pick up mail. At its heart stood a potbellied stove, which was the sole source of heat in the store. Around this, people played checkers, discussed the politics of the day, or gathered for just a good gossip. From time to time, farm auctions were held in front of the general store. Let’s work together to return this property to its former greatness! The community is full of ideas for new uses and wants to participate in a good plan. We believe several of our elected officials have been – or will be – in touch with Nelin Realty about this property, too. We invite Mr Nelin to meet with us at an upcoming Middle Island Civic Association meeting or in a smaller group, whichever he feels more comfortable with. We urge him to please contact us as soon as possible.